A couple of years ago I came across a recipe in a food magazine for a watermelon and Feta Cheese salad. At first I was all intrigued until I went down the ingredient list and saw onion followed by some type of vinaigrette. Then one day I decided to make what in my own head sounded good. A simpler version of said salad. I have to say that this has become a favorite and it’s a fantastic salad but also a fantastic meal in itself on hot summer days or nights. It takes minimal effort, and most importantly, there is no cooking involved! 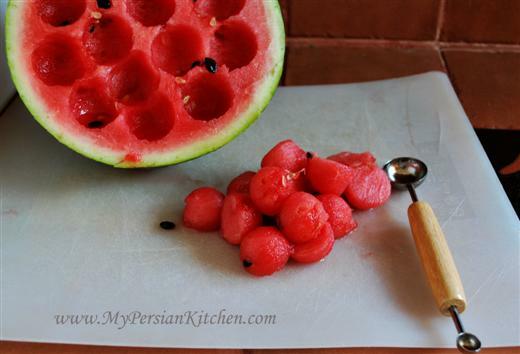 The first step is to simply cut up your watermelon. My melon baller is one of my favorite kitchen toys! It’s always fun to use it! I have found that it’s best to mix the watermelon with the mint first, either in a mixing bowl or in the same bowl that you will serve the salad. 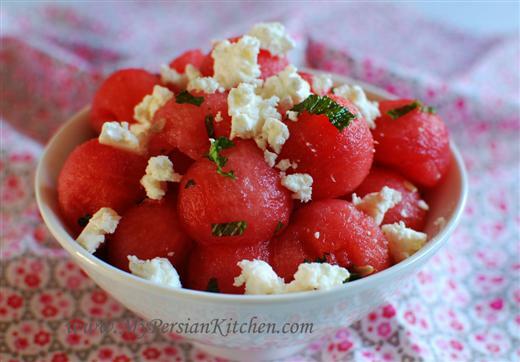 Then sprinkle the crumbled feta on top of the watermelon and avoid further mixing the salad. Of course you can play around with the ratio of the mint and feta cheese to make it more appealing to your palate. I have no doubts though that you will enjoy the delicious combination of sweet, salty along the freshness of mint. I think this is definitely a winner! 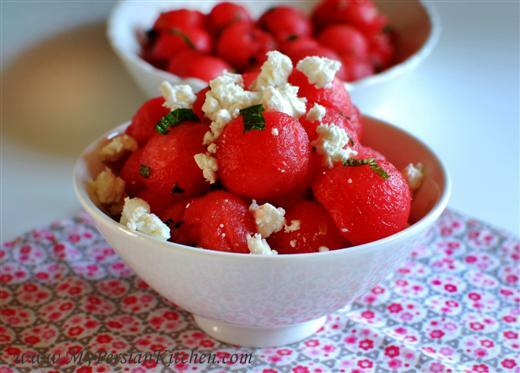 What about you, have you ever had or made a watermelon and Feta Cheese salad with onion and a dressing? Do you like it? Yes? No? Why? I am really curious to hear your take on it! greetings back to you from humid Maui! There is no doubt that the two go together, now just because there is no lavash or sangak involved we can call it salad ! but the saltiness of feta & sweet juiciness of watermelon is the best combination on a hot day. I remember back home I always sprinkling salt on watermelon, I suppose body craved for salt after chasing a plastic football in hundred degree dry heat for hours in the dusty streets …..and then the match was instantly over when the ball puncher !!! I love this low key yet bold flavor combo, and I don’t think any dressing is needed, unless someone desires it. Wow! How clever! I remember at my grandparents home we always had this three combination (Watermelon, Herbs & Cheese) with bread. This way, it is all mixed up in a bowl ready and one can still accompany it with lavash or pita. Love it. I am going to make it. Thanks. One of my all time favorite salads – so simple, so good, so refreshing. Sarvin, Awesome! Did you pass on my website??!! I initially played with the idea of adding soaked walnuts but then decided to keep it simple. Did you use Italian basil or Persian Basil? I’ve had a fantastic watermelon, jalapeno, and cilantro salad. Little bit of lemon juice added. It was at Thighs and Pies in Brooklyn (great fried chicken).